I feel that this is the most fun and exciting fishout that the club puts on. In a nutshell, we take riding horses and pack mules and pack into the wilderness area of the Sierra's. We always leave the Tuesday after Labor Day. The wranglers lead us in to a chosen lake, drop us off, and they take the animals back to the pack station. Six days later Sunday they come back out and pick us up. Meanwhile, we are in the most beautiful part of nature's world, as you can see by the picture is a bonus we catch lots of fish. This year the participants were Oscar Guzman, Les Penparze, Ozzie Schmidt, Roger Finke, Mike Pinelli, and a guest of Les, Joe Becher from the San Jose Fly Club. When you are planning a trip like this one it does take a lot of preplanning. If you forget something you can't just jump in the truck and run to the nearest store. We get better at this every time. This year we had everything to be very comfortable, ask the eight mules that had to carry it in. Lillian Lake was the base camp in the ANSEL ADAM WILDERNESS AREA. This was approximately 12 miles in and approximately four hours in the saddle. It was an easy ride compared to last years seven and eight hour rides. 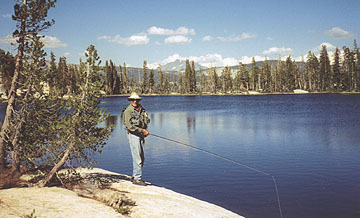 From Lillian Lake and just a 30-minute walk with a daypack for your lunch, you can fish up to 10 small lakes in the area. Roger was the most adventuresome. He ventured out almost everyday to a new lake. Some days others would go with him. Trails were fairly well marked but we always took our compass and map. This was the great part of this type of fishing. As you are walking back to a lake you see on the map, there are small, small, lakes maybe 30 to 40 feet across; you can easily cast to the other side. You put a small dry fly on and land it in the middle of this puddle and BAM! You have a fish. 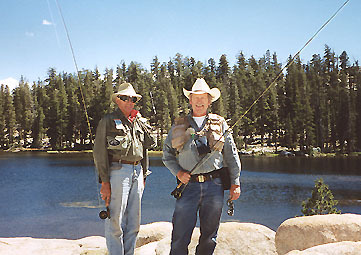 Roger had some tremendous luck on Stanford Lakes, just south of Lillian. Most of us stayed on Lillian because fishing was great and we became comfortable in the camp. The scenery was breath taking. The view of the Minarets (meaning small temples) Mountain range is something you never forget. We were at 8,868 feet with granite rock mountains up to 9,521 feet all around us in an amphitheater style. Before we left we had a meeting at the fish masters house to make all the plans. This was the fun part. To keep the trip environmentally friendly we made sure that all items we carried in could be carried out. Last year Ken Tetzel made a small box to be used as an out house. We dug a large hole, put the box outhouse over the top. We put up a tarp with a scarf that can be thrown over the side to indicate the room was in use. This also kept six people from digging a bunch of holes in the wilderness as they had a need. This year at the meeting Ken was not a participant so I asked for a volunteer to make the box. Joe from the SJ Club said could do that I am a cabinetmaker. YOU WOULD NOT BELIEVE. This year the box was of plywood like last year but the seat was made of Cherry wood and had a sliding door. Life should be so good. This pack station was a very good one and we will keep them on the list. They had good horses, and they matched people to the horses. Roger was put on a draft horse, Ozzie on a long legged thorough breed, and I don't know why they gave Joe a mule. Joe and that mule were the only mismatch (I think). Next year we will go to another new lake and area. So far we have four openings. Call Oscar Guzman if you want on the list.